Embroidery has a long history in Mexico. Most textiles from the pre-Hispanic era have perished, damaged by heat and humidity, but surviving cloth fragments prove that decorative stitching was sometimes used on clothing. When Spanish conquistadores reached Mexico in 1519, they were full of praise for the achievements of spinners, dyers, weavers and embroiderers. After the conquest, Spanish needlework skills – including a wide variety of stitches, many of which are thought to have originated in ancient Egypt, Persia and other parts of the Near East – were widely taught in mission centres. Further inspiration was later provided by textiles imported from China and the Philippines. Today Mexican women embroider home-woven and bought cloth with a vast range of stitches and designs. After the Spanish conquest of Mexico, Catholic nuns kept their churches provided with 'whitework'. 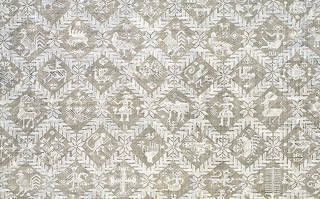 This term is used for textiles where the stitching is the same colour as the foundation fabric, usually white linen, and includes the technique of 'deshilado' or drawn threadwork. With deshilado, selected threads are pulled from the ground fabric; the rest are bound and reinforced with decorative stitching. As in Spain, drawn threadwork was much used to embellish white linen christening gowns and bonnets, wedding shirts, altar cloths, surplices for choirboys, priestly albs and other religious garments. 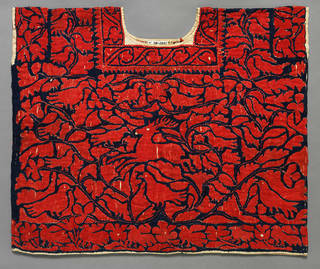 An intricate 19th-century altar cover in our collection features a broad central area of drawn threadwork. Diamonds, arranged in a lattice pattern, are filled with finely worked designs. These include spider monkeys, mermaids, women wearing hats and wide skirts, birds of many kinds, flowers, sacred hearts, crosses and hands. Girls of all social classes were taught needlework skills. Satin, or flat, stitches were often used for animals, birds, flowers and foliage; shading devices such as 'long and short ' enabled embroiderers to achieve subtle colour changes. Although embroidery threads were mostly silk, cotton or linen, metallic threads were sometimes used for the clothing of the elite and for ecclesiastical work. With the technique known as couching, gilt threads and purl (very fine gold or silver wire) were laid across the surface of the ground and secured by a succession of small stitches. In Mexico, as in Europe, samplers (or examplers) allowed pupils to practice their newly acquired skills. Samplers were a preparation for adult life. Makers knew that their needleworking skills would help them after marriage to organise their households and to manage their personal adornment and that of their families. They also provided them with useful memoranda of stitches and designs. For more experienced needleworkers, samplers served as a method of measuring and recording their attainments. 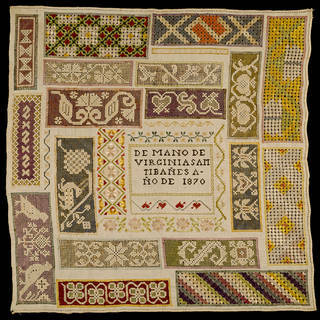 Few if any samplers survive from the early decades of colonial rule, but examples from the late-18th and 19th centuries offer invaluable information about designs and embroidery techniques. A beautiful linen example from our collection is embroidered with gilt thread, purl, spangles (small sequin-like pieces of glittering metal) and coloured silks to display a butterfly, birds, animals, flowers and religious symbols. The gilt thread is both couched and satin stitched. Shimmering silks are used for satin, long and short, outline and stem stitches, with French knots. Crossed stitches, extremely fashionable in Europe during the 19th century, became so popular in Mexico that they eventually overshadowed most other stitches. By counting the warp and the weft of the ground, which was often linen, embroiderers filled samplers with densely spaced animal, bird and plant motifs. This style of work was popular for the decoration of tablecloths, bedspreads, pillows and other types of household linen. 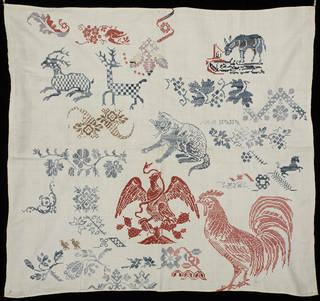 A cotton sampler, rich in imagery and embroidered with cotton thread, displays stags with checkerboard patterning, a naturalistic cat, a flamboyant cockerel and other variously sized creatures, interspersed with decorative lines of floral and leaf-like patterning. The eagle with outstretched wings and a serpent in its beak, perching on a nopal (prickly pear cactus), commemorates the founding of the Aztec city of Tenochtitlan. When Spanish rule ended in 1821, this design became a popular symbol of Independence and national pride. Samplers of this type, characterised by the random placing of individual motifs, are known as spot samplers. The functional aspect of sampler-making was often represented by the inclusion of darning and insertion stitches, together with areas of drawn threadwork and cutwork. Some makers included the letters of the alphabet, regarded as useful practice for the marking of linen. 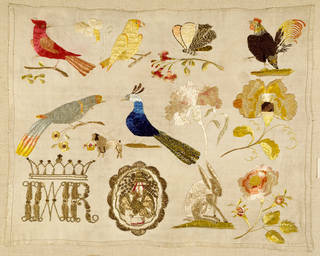 A linen sampler, dated 1870, was embroidered in silk by Virginia Samtibañes. A range of geometric patterns, stylised birds and plant motifs were worked in cross stitch. She has also included areas of drawn threadwork. Although the maker was carrying out a routine task as part of her training, her creativity and sense of design have personalised a standardised exercise. Samplers of this type are known as 'band' samplers. Arranged in orderly rows, designs like these served as border decoration for linen, domestic furnishings, costume accessories and purses. Glass beads were introduced into Mexico after the Spanish conquest. Colonial import restrictions kept glass beads in short supply until Independence, when increased availability made them popular for samplers, napkins and costume trimmings. One sampler, made by Encarnación Castellanos and dated June 1850, has small panels delicately embroidered with minuscule glass beads. 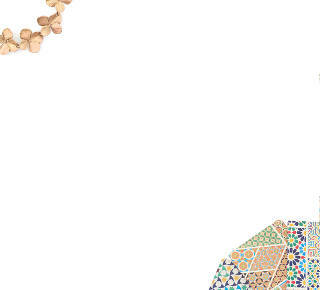 Beaded designs include a spider monkey next to a house and a tree, and lines of floral decoration. Printed pattern books – common throughout most of Europe after the 16th century – remained rare in Spain and Spanish territories, where samplers continued to serve as design inventories. 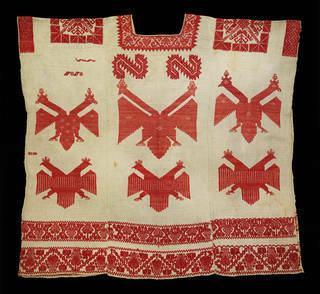 Even today, in indigenous communities where embroidery is regarded as an important skill, some girls still make samplers. Our textile collection includes a rare and interesting group of 19th-century huipiles (traditional women's tunics), probably made in the Mazatec town of San Bartolomé Ayautla, Oaxaca. One was plain- and gauze-woven on the backstrap loom from hand-spun white cotton, and assembled in three panels. 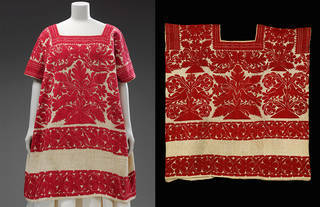 Red cotton thread was used to satin stitch the symmetrically placed designs. Triangular urns of flowers, surrounded by birds, are a stylised version of the universal and ever-popular 'tree of life' foliage motif. The idea of a 'World Tree', important in many cultures, was part of the cosmology of the Aztecs, the Maya, and other ancient civilisations of Mexico. The neck opening (cut into the centre panel) and the armholes are bordered by wide bands of stitching. 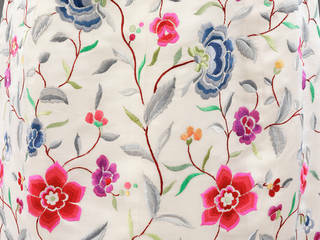 Two horizontal bands of floral motifs pattern the garment's lower area. Interestingly, all the stitches are vertical; only the armhole area has horizontal stitches. Though the state of Oaxaca retains a large indigenous population, and many women still wear a home-woven huipil, this labour-intensive style died out several decades ago among the Mazatec. Contemporary examples are rarely as intricately worked. With industrialisation, the availability of commercially produced cloth and thread increased. The Mazatec huipil entered a period of transition, as women slowly abandoned this hand-woven style. Another 19th-century example is made from a single width of bought cotton cloth. Seamed down the sides and hemmed along the bottom, it has an opening cut for the head. Densely spaced designs cover the entire surface of the garment. Worked with red and blue cotton thread, and a minuscule amount of wool, they include flowers, birds and a centrally positioned stag. The stitches – laid satin, stem and long-armed cross – have relaxed and loosened over time. Surface embroidery of this type, where very little thread is used on the reverse, is an economical form of decoration that is still practised today in many areas of Mexico. Indigenous garments are simple to construct. Their visual interest and elegance owe little to tailoring; instead they rely on the appearance and texture of cloth and the aesthetic appeal of design motifs. 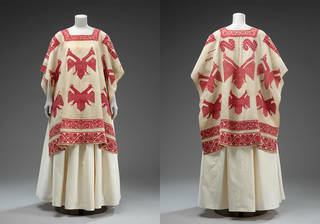 The maker of the 'double-headed eagle' huipil was highly-skilled, working with hand-spun white cotton on a backstrap loom, interspersing five picks (lines) of plain-weave with a single pick of gauze-weave to create the ground fabric. The eye-catching designs, brocaded with supplementary red cotton weft threads, are also woven. Cross stitch has been used to decorate the shoulder area and the square-cut neck-opening. A short section of cloth, woven as described, was added to each of the three panels to make the garment longer. The double-headed eagle, frequently represented before the Spanish conquest and repeated here, may be an ancient design. The N-shaped serpent, shown twice, is strongly reminiscent of the pre-Hispanic feathered serpent. Two of these huipiles were acquired by the celebrated British archaeologist Alfred Percival Maudslay (1850 – 1931). Best known for his work in the Maya area, he also spent several winters with his wife at their home in Oaxaca, before moving to San Ángel, near Mexico City, and finally returning to Britain in 1907. Now in our collection, these garments embody the technical prowess and enduring heritage of Mexican weavers and embroiderers. Find out more about traditional Mexican dress. Try you hand at some Mexican-inspired embroidery with our free, downloadable patterns.